ANNA IWANOVNA – Anna Ioannovna imperatricea i camoderschiza wserossinskaja (rossice). Anna Joannowna imperatrix totius Russiae - STENGLIN, J. Title : ANNA IWANOVNA – Anna Ioannovna imperatricea i camoderschiza wserossinskaja (rossice). Anna Joannowna imperatrix totius Russiae. Map maker : STENGLIN, J.. Date : St. Petersburg, 1743. Size : 12.7 x 9.0 inches. / 32.3 x 22.8 cm. Description :Extremely rare half portrait print of Anna Ivanovna (7 February [O.S. 28 January] 1693, Moscow – 28 October [O.S. 17 October] 1740) reigned as Duchess of Courland from 1711 to 1730 and as Empress of Russia from 1730 to 1740. 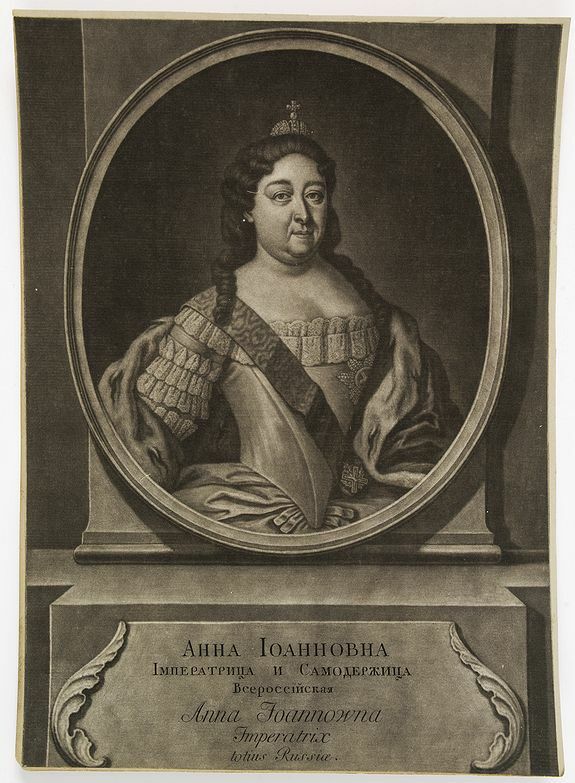 Anna was the daughter of Ivan V of Russia, as well as the niece of Peter the Great. Johann Stenglin was a well known engraver, born at Augsburg in 1715, he studied under Bodenehr, and engraved after Dinglinger, Grooth, Haid, Klein, and De Meytens. In 1743 he received a summons to St. Petersburg, and engraved portraits of Russian Czars and members of the Royal Family. He died at St. Petersburg in 1770. Mezzotint was the first tonal method to be used, enabling half-tones to be produced without using line- or dot-based techniques like hatching, cross-hatching or stipple. Mezzotint achieves tonality by roughening the plate with thousands of little dots made by a metal tool with small teeth, called a "rocker." In printing, the tiny pits in the plate hold the ink when the face of the plate is wiped clean. A high level of quality and richness in the print can be achieved. The process was especially widely used in England from the mid-eighteenth century, to reproduce portraits and other paintings. Mezzotints produced in Russia are very rare. Rovinskij II, N 7. Nagler XIX, 415, 2. Condition : Mezzotint. Cut to plate mark. Contemporarily laid down on paper. Good impression.